Candied crab apples in China. At the heart of every family are twin pillars of food and love. In my opinion, these are two of the most important parts of a parent's job: making sure you're eating good food together and loving each other. When it comes to food, you need to figure out three meals a day and think about how you are going to give everyone the nutrition they need, ensuring they like it, without boring them (or yourself). Likewise, you have to think about love everyday — how to express it, cultivate it and serve it up in interesting ways. This trip has us focusing on these pillars in new and deeper ways. Some families, like ours, have one picky eater, who can wreak havoc at family meals. Ours is 8-year old Lola. She loves all kinds of white foods — bagels and cream cheese, macaroni and cheese, quesadillas, plain pasta, white rice, etc. At home, meal times are tough because I either end up catering to her with something different than what I made for the rest of the family, or I refuse and she ends up in tears and goes to bed hungry. Before we left on this trip, my sister (who was also a picky eater as a child) expressed concern about Lola. She told me to pack special food, like granola bars, for her so she wouldn’t starve. I couldn’t bring myself to do it. It felt like the antithesis of what we set out to do with this adventure — let the children explore new worlds without coddling them. Lola is naturally thin, and though I had visions of her becoming frail and weak from lack of nutrition, I put this out of my mind. I had faith that she would open her mind (and mouth) and just eat. Much to our surprise — and pleasure — Lola ended up being our best eater in Asia. She loved Japanese food! She was willing to try any and every dish. At our first lunch in Kyoto, she ate the udon noodle soup with such gusto, it made her family laugh. Lola masters eating with chopsticks. 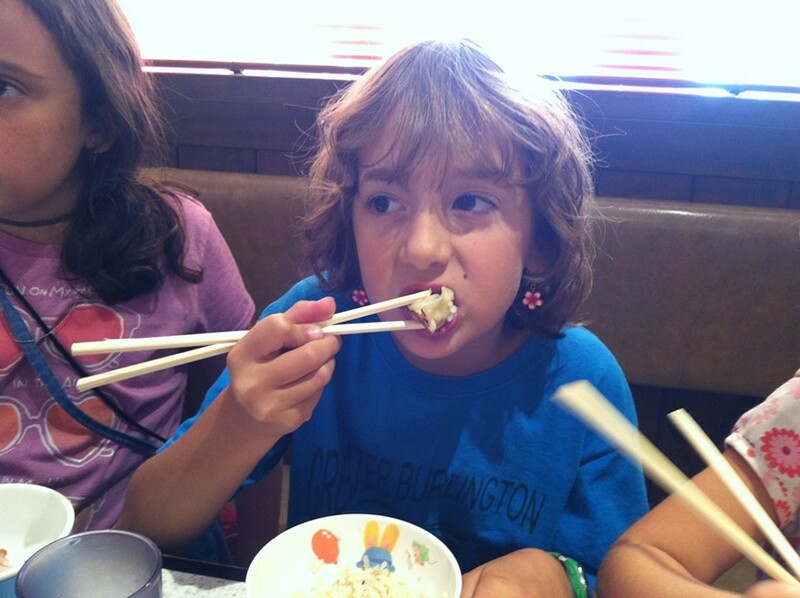 Over the next two days, she dedicated herself to mastering chopsticks (most restaurants had no other utensils). After her triumphant success, she spent her own money on a small pair for herself. We used those chopsticks (Kaya also bought a pair) at every restaurant meal until they got lost in China. 2)	Japanese food is always served like a beautiful work of art, with small colored ceramic bowls and different shaped plates. The food is neat and arranged in a pleasing pattern. Add to this the ritualistic nature of the Japanese meal: You take off your shoes, sit cross-legged on tatami mats on the floor, then wipe your hands and face with a hot towel before eating. 3)	Using chopsticks added a fun challenge. At first, Lola was frustrated that she couldn’t pick up her noodles, especially because Dahlia got it right away. After failing to be able to eat properly at the first few meals, Lola was motivated. She wanted to prove to Dahlia that she was just as capable. A challenge like this is a great way to get kids to forget about what they are eating and master how to eat. The appreciation for the food itself comes later. Ironically, I have become our family's picky eater. My pregnancy made me nervous to eat fresh fruit and vegetables in China. I didn’t know where they came from or what pesticides were used on them. And I was afraid that if they were already peeled, they could contain bacteria that could make me sick. The children got a typhoid vaccination, but I didn't. So I avoided eating a lot of fresh fruit and vegetables, but that made me worry about the lack of nutrition the baby was getting. 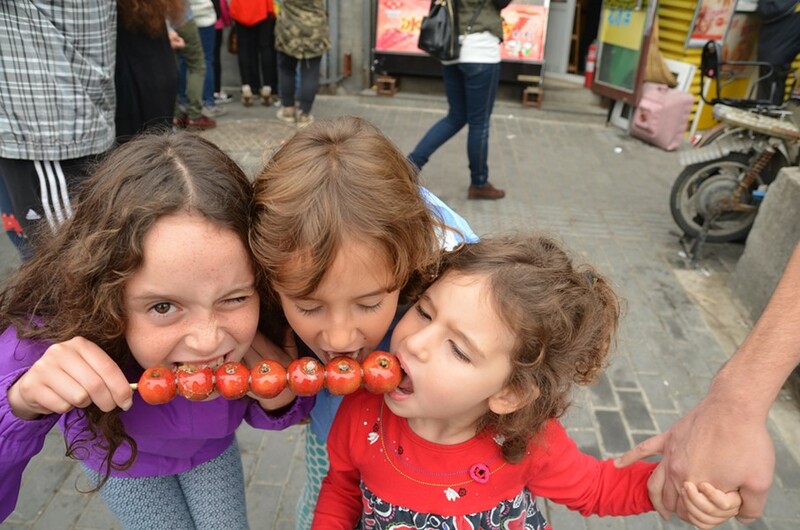 The girls were more confident and tried fun things like candied crab apples Jodi bought for them on the street. I wanted to laugh and cry at the same time. What a surprise to hear my (former) picky eater imploring me to stop complaining about the meat and just feed myself. Why couldn’t I? I had no answer for her. This is who I am now. I just can’t eat meat anymore. It was a sweet switch between myself and my middle daughter. Later that night, I smiled thinking of how she was trying to love me in the same way I try to love her. Stay tuned for next week’s post, Part II, about love!